Take some of Mozart’s most beloved themes, sprinkle in a dash of holiday tunes and what do you get? 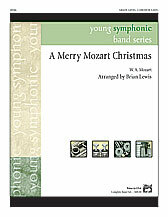 A Merry Mozart Christmas, of course! This clever arrangement combines themes from A Little Night Music, The Marriage of Figaro, Turkish Rondo and Symphony No. 40 with traditional Christmas tunes you’d never expect. A true audience pleaser that your students will love to play!